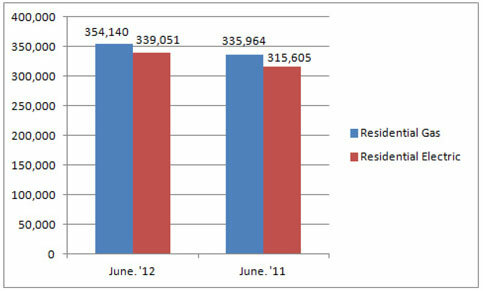 U.S. shipments of residential gas storage water heaters for June 2012 increased 5.4 percent, to 354,140 units, up from 335,964 units shipped in June 2011. Residential electric storage water heater shipments increased 7.4 percent in June 2012, to 339,051 units, up from 315,605 units shipped in June 2011. For the year-to-date, U.S. shipments of residential gas storage water heaters decreased 1.9 percent, to 2,044,814, compared to 2,084,907 units shipped during the same period in 2011. Residential electric storage water heater shipments increased 0.5 percent year-to-date, to 1,944,610 units, compared to 1,935,677 units shipped during the same period in 2011. 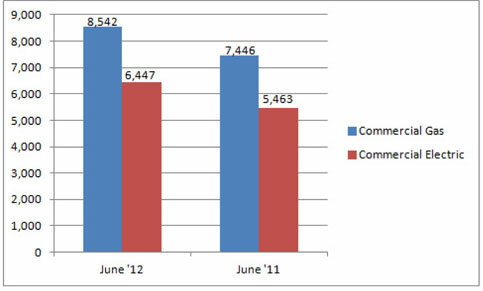 Commercial gas storage water heater shipments increased 14.7 percent in June 2012, to 8,542 units, up from 7,446 units shipped in June 2011. Commercial electric storage water heater shipments increased 18 percent in June 2012, to 6,447 units, up from 5,463 units shipped in June 2011. Year-to-date U.S. shipments of commercial gas storage water heaters decreased 3.7 percent, to 42,461 units, compared with 44,102 units shipped during the same period in 2011. Year-to- date commercial electric storage water heater shipments increased 5.5 percent to 32,887 units, up from 31,186 units shipped during the same period in 2011. 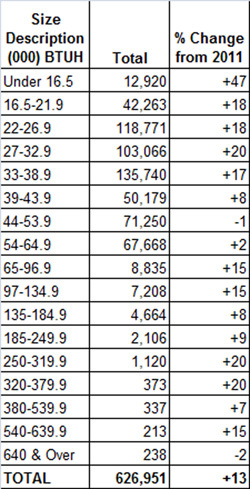 U.S. shipments of gas warm air furnaces for June 2012 increased 2.8 percent, to 202,727 units, up from 197,285 units shipped in June 2011. 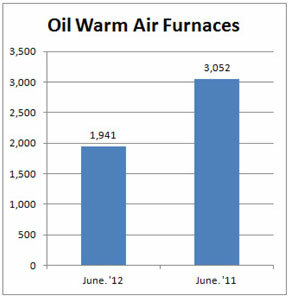 Oil warm air furnace shipments decreased 36.4 percent, to 1,941 units in June 2012, down from 3,052 units shipped in June 2011. Year-to-date U.S. shipments of gas warm air furnaces decreased 3.7 percent, to 945,613 units, compared with 981,646 units shipped during the same period in 2011. Year-to-date U.S. shipments of oil warm air furnaces decreased 35.7 percent to 12,515, compared with 19,450 units shipped during the same period in 2011. U.S. shipments of central air conditioners and air-source heat pumps totaled 857,362 units in June 2012, down 3.6 percent from 889,014 units shipped in June 2011. 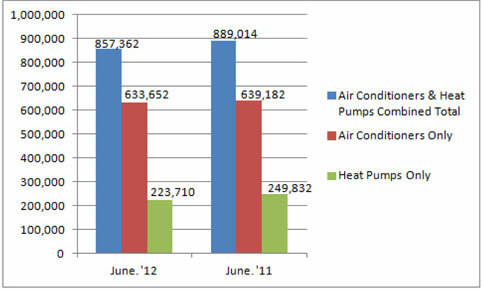 U.S. shipments of air conditioners decreased .9 percent, to 633,652 units, down from 639,182 units shipped in June 2011. U.S. shipments of air-source heat pumps decreased 10.5 percent, to 223,710 units, down from 249,832 units shipped in June 2011. Year-to-date combined shipments of residential central air conditioners and air-source heat pumps decreased 2 percent, to 3,226,041 units, down from 3,292,896 units shipped in June 2011. Year-to-date shipments of central air conditioners increased 1.5 percent, to 2,257,258 units, up from 2,224,767 units shipped during the same period in 2011. 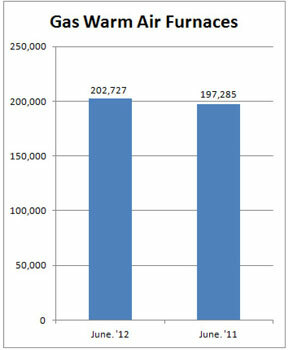 The year-to-date total for heat pump shipments decreased 9.3 percent, to 968,783 units, down from 1,068,129 units shipped during the same period in 2011.